← Neatness: A Sign of Godliness or Compulsion? 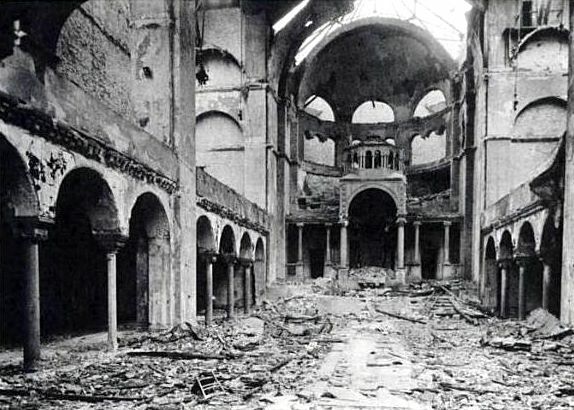 Interior of Berlin’s Fasanenstrasse Synagogue after it was set on fire during Kristallnacht on November 9, 1938. Photo by Abraham Pisarek, used courtesy of Wikipedia. Friday, November 9th, was the 74th anniversary of Kristallnacht (The Night of Broken Glass), when the Nazi hoodlums, aided by many ordinary Germans and Austrians, unleashed their fury on their Jewish fellow citizens. One thousand synagogues were burnt. Seven thousand businesses and countless homes, schools and hospitals were trashed and looted. Thirty thousand Jews, including my seventy-year-old Uncle Heiner, were arrested. I have always thanked my lucky stars that my family had already left Germany for Belgium. This year I attended a commemoration organized by the Jewish Faculty & Staff Association of the New York City College of Technology in Brooklyn. Roald Hoffmann, born in 1937 in Zloczów, a small town in Jewish-hating Poland, spoke this year. Luck as well as guts, smarts, and material resources had to be on the side of the small fraction of European Jews who survived. Roald’s’s father, a civil engineer, provided essential services to his town, so in 1941 the family was incarcerated in a labor—as opposed to extermination—camp. Two years later, before being shot, the father smuggled Roald and his mother out of the camp. For the next 15 months a schoolteacher hid the two, along with three others, in the attic of his school. Anne Frank’s attic was luxurious by comparison. Light came through a tiny window; there was no heat, so in winter the family froze; there was little food, and of course no toilet. But they survived. It seems miraculous that the five-year-old boy managed to be quiet during his long incarceration. Such stories have convinced me that in life-threatening situations, children sense what is expected of them. When asked, Roald gratefully recalled his mother’s skill at keeping him entertained. Hoffmann’s mother remarried and the family arrived in the U.S. in 1949. Like many survivors, Roald felt a need to excel. He went to schools in Queens and Brooklyn, eventually graduating from Stuyvesant High School in Manhattan, followed by Columbia and Harvard. In 1981 he won the world’s most coveted honor, the Nobel Prize in Chemistry. As if that were not enough, he is also a widely published playwright and poet. For many decades, Hoffmann has been in touch with the Dyuk family, who saved him during the Holocaust. While the Communists were in charge in Eastern Europe he jumped through hoops to supply them with extra food. Finally in 2006 he returned to Zloczów. He shared food with the descendants of his benefactors, visited the now somewhat improved schoolteacher’s attic, the old Dyuk family graves, the bare site of what once was the Jewish cemetery, and the mass grave that held his grandfather. Hoffmann’s talk was entitled “Returning, Remembering, Forgiving.” I know what he meant. Can one truly forgive the Holocaust? Before World Ward II, 4,000 Jews lived in Zloczów; only 200, including five children, survived. Since I survived the Holocaust as a hidden child in Belgium, my path was much easier than Hoffmann’s. Yet like him, it took me decades to go back to my native land. When I finally did, old childhood memories resurfaced and I almost felt at home. I admired the landscape, the German art and felt that those I met were genuinely friendly and helpful. I also knew that those who perpetrated the atrocities of the past were dead. Life has been good to me and my past has shrunk in importance. Would it be a betrayal of Ruth Iris, who sat next to me in school, or of the millions of others whom the Nazis murdered in cold blood, if I forgave Germany? Have my wounds healed or am I simply oblivious? I am glad that several times a year I am reminded of the unfathomable reality of the Holocaust having taken place. 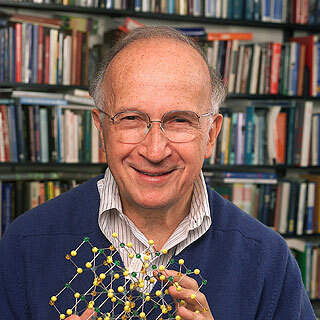 Roald Hoffmann presents a monthly science series, Entertaining Science, at the Cornelia Street Cafe. Suzanne Loebl is the author of At The Mercy of Strangers: Growing Up on the Edge of the Holocaust. This entry was posted in history and tagged at the mercy of strangers, cornelia street cafe, entertaining science, hidden children, holocaust, holocaust survivors, jfsa, kristallnacht, nazi germany, new york city college of technology, roald hoffmann, the question of forgiveness, world war ii. Bookmark the permalink.